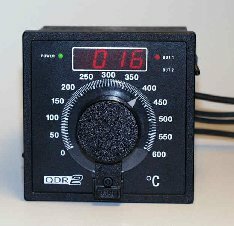 Electronic temperatur regulator with easy handling. Technology: Analog electronic. Attention: The series » QDR-2 « is out of production - it may be possible to produce singel regulators - repairs are possible without problems Replacement for the types QDR-2 are the types R-1100 and R-1120. Simmilar connection way as with the well-known »S+B Schuntermann & Benninghoven« -regulators or »DE Drews« or »Elstein« or »Dr. Krieger«. Inside modern analog-electronic, high-quality, reliable, long lasting and exact. Process temperature indication by LED 3 ½ digits; function-indication by yellow LEDs. 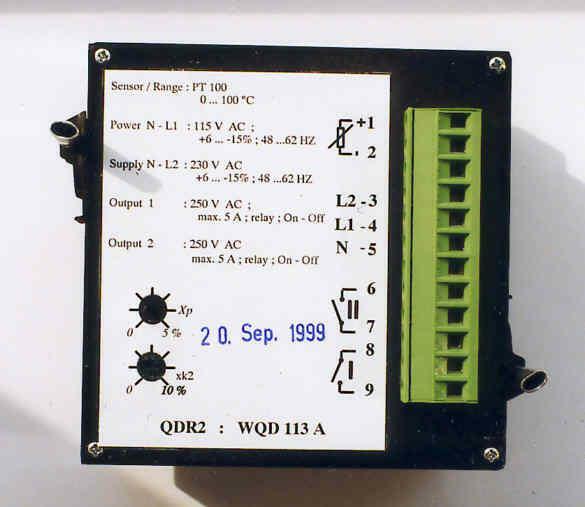 Input thermocouple: Fühlerbruchsicherung and internal Vergleichsstelle sind eingebaut. Ein Verpolungsschutz ist vorhanden. Up to 50 Ohm resistance of cable, ist kein Abgleich nötig. Input Pt 100 (DIN): 2- or 3- Leiterschaltung anschliessbar. Fühlerbruch- and Kurzschlussüberwachung sind vorhanden. Max. possible resistance of cable: for 3- cable wiring: 50 Ohm. Fühlerstrom: Ca. 0,5 mA. setpoint changing: The setpoint is frontseitig mittels präzisem Potentiometer mit Feststeller auf einer in °C geeichten Skala einstellbar. Feedback: Xp 5% adjustable (rear side for adjustion of feedback); faster feedback are possible, up to 40 times faster. Or tension, bistabil; ca. 16V DC max. 20 mA short circuit proof. Or steady, The type of output (current or tension) is choosen automatically by the value of the working resistance. Case for panel-mounting: Dimensions: 96 x 96 mm (DIN43700); deep: 82 mm. panel cutaway dimensions: 92 +0,5 mm x 92+0,5 mm. We do have very special types, for example regulators QDR-2 or R-1100 for soldering machines from company Pfaff. Please, ask us.